The NVIDIA CUDA Fast Fourier Transform library (cuFFT) provides GPU-accelerated FFT implementations that perform up to 10x faster than CPU-only alternatives. Using simple APIs, you can accelerate existing CPU-based FFT implementations in your applications with minimal code changes. As your application grows, you can use cuFFT to scale your image and signal processing applications efficiently across multiple GPUs. cuFFT is a foundational library based on the well-known Cooley-Tukey and Bluestein algorithms. It is used for building commercial and academic applications across disciplines such as computational physics, molecular dynamics, quantum chemistry, seismic and medical imaging. With support for batched transforms and optimized precision arithmetic, it is widely used for building deep-learning based computer vision applications. cuFFT performs faster than alternatives through new algorithms and optimizations. 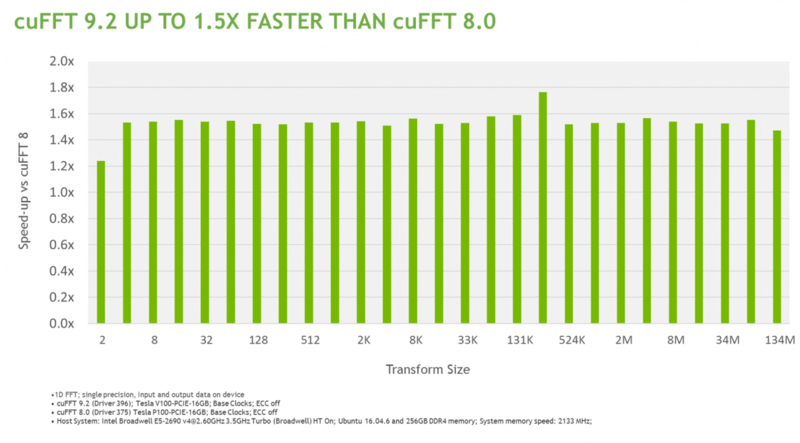 The latest version, in CUDA 9.2, runs up to 1.5x faster than the previous version. Your application automatically benefits from such regular platform improvements without any code changes. Flexible input & output data layouts, similar to FFTW "Advanced Interface"
The cuFFT library is freely available as part of the CUDA Toolkit. Find additional examples in the cuFFT code samples section of the CUDA documentation.